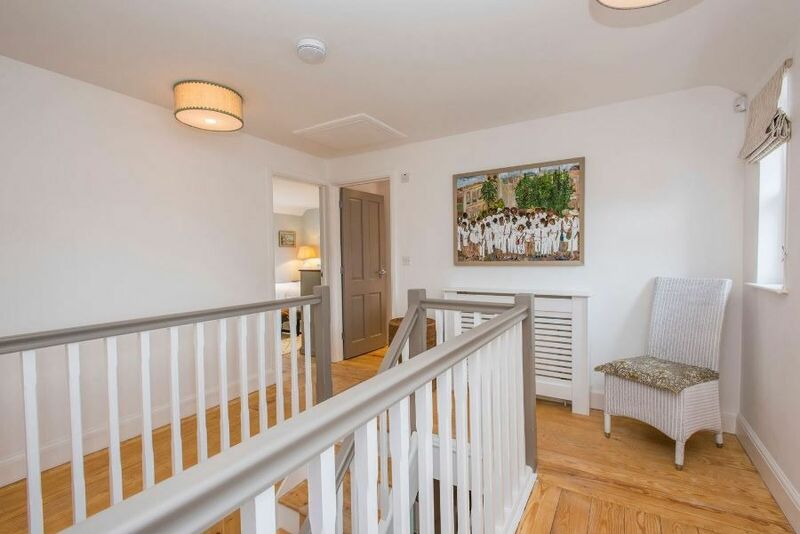 Downstairs has been cleverly opened up to create a fabulous light and airy open plan living area, with a separate snug. There is a modern central heating system, making this a warm and inviting place to stay throughout the year. Entrance into the hall, where there is a large built-in coat cupboard, thoughtfully stocked with everything you'd need for a picnic. 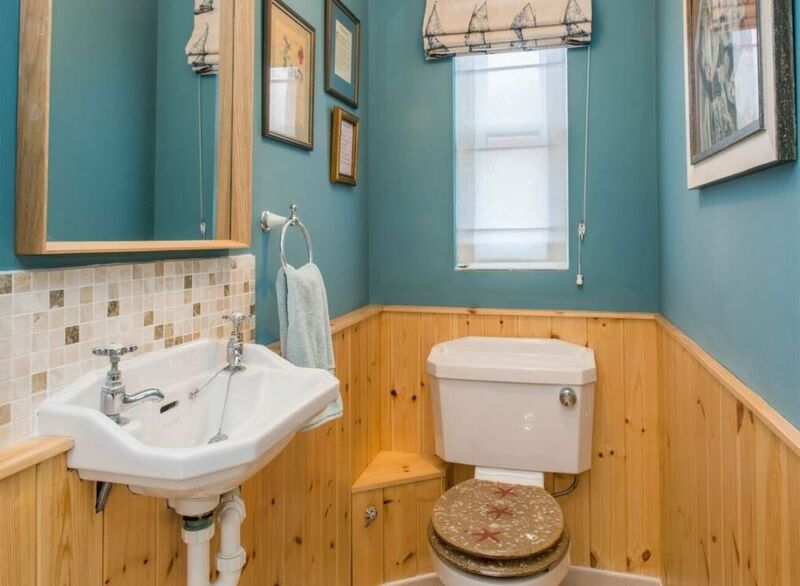 Cloakroom: stylish fitted WC and hand basin. 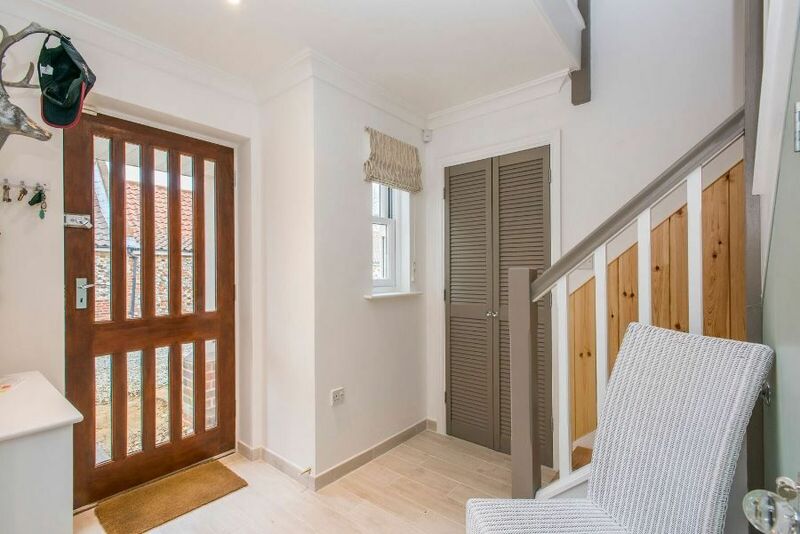 Access through to the fabulous open plan living area. Living area: a fabulous sociable space incorporating a contemporary kitchen, dining area and stylish sitting area. 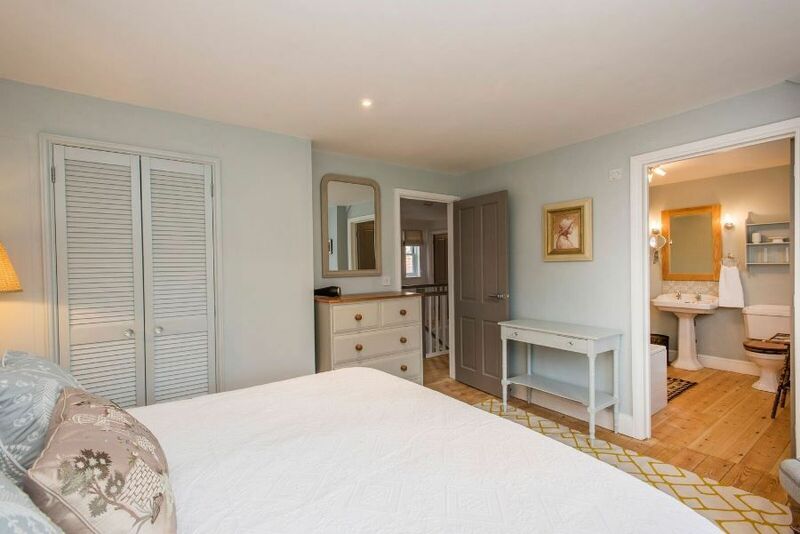 This lovely room has two sets of glazed doors opening out to the west facing walled garden. 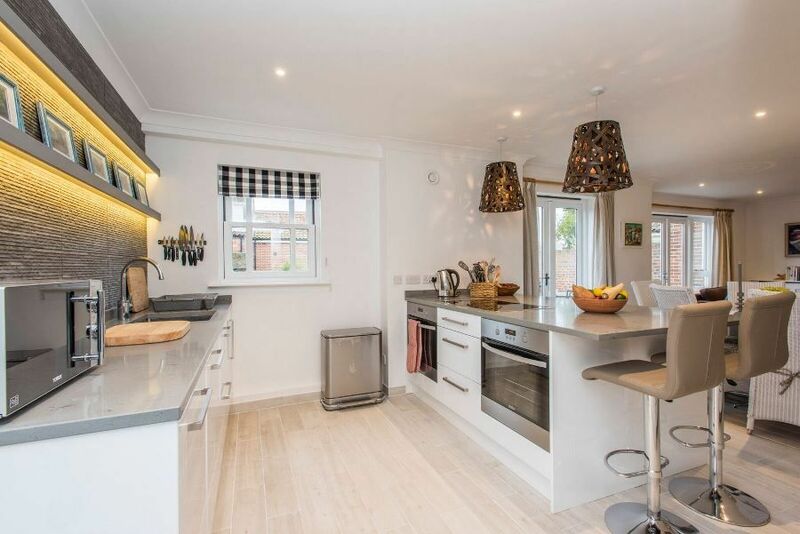 Kitchen area: a superb fitted contemporary grey/white kitchen with a feature slate tile wall and integral appliances including two Zanussi electric ovens, a ceramic hob and a dishwasher. There's a handy breakfast table and two chairs - perfect for two! Conservatory: a fabulous room (leading from the kitchen area) providing a light and airy dining area overlooking the garden. Guests may dine in comfort around the circular wooden dining table with six rattan chairs with seat cushions. 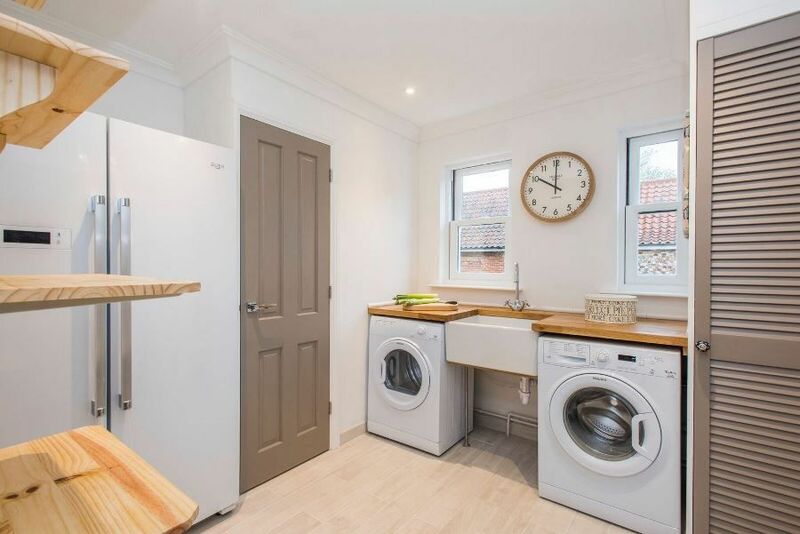 Utility room: a really useful space with an American style fridge/freezer, washing machine, tumble dryer, sink and plenty of shelving for storage. Sitting area: stylishly furnished in an eclectic style with stunning artwork, two comfy sofas, two fabric armchairs, a large wall-mounted flat screen digital TV, contemporary electric flame-effect fire. Snug: perfect place to escape to, brightly decorated with an Argentinian theme, with a comfy red L-shaped sofa and a wall-mounted TV. There is the advantage of free fast wifi at Arthur's . The stairs are not steep and have a striped runner, with a hand rail. All the bedrooms have been furnished and decorated to an extremely high standard and have stripped wooden floorboards with rugs. High thread count bed linen and fluffy towels are provided for guests, with extra blankets provided for chilly nights. Bedroom 1: beautifully presented room overlooking the walled garden, decorated in restful grey/blue tones, with stripped wooden floorboards and a rug, a super king-size rattan bed, bedside tables and lamps, built-in wardrobe which contains a safe for valuables, chest of drawers, dressing table and a bedroom chair. 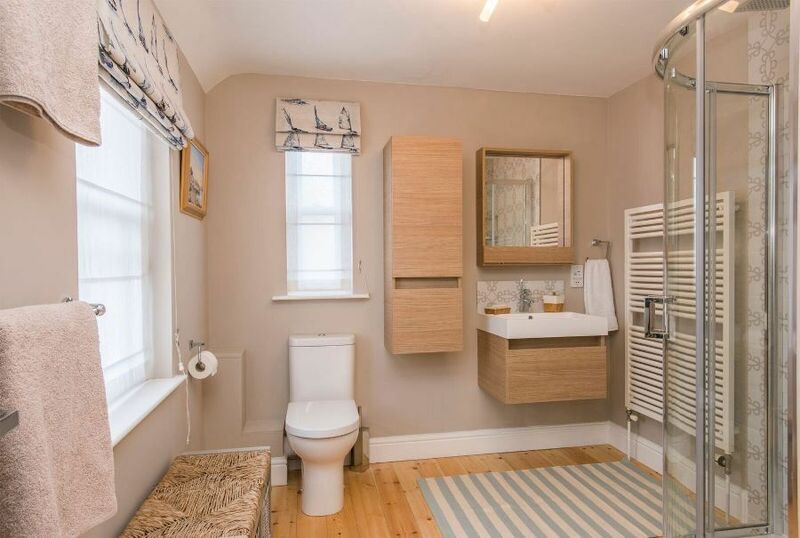 En-suite: contemporary light and spacious room which contains a bath with shower mixer taps, a fully tiled separate shower cubicle, hand basin, heated towel rail, WC. 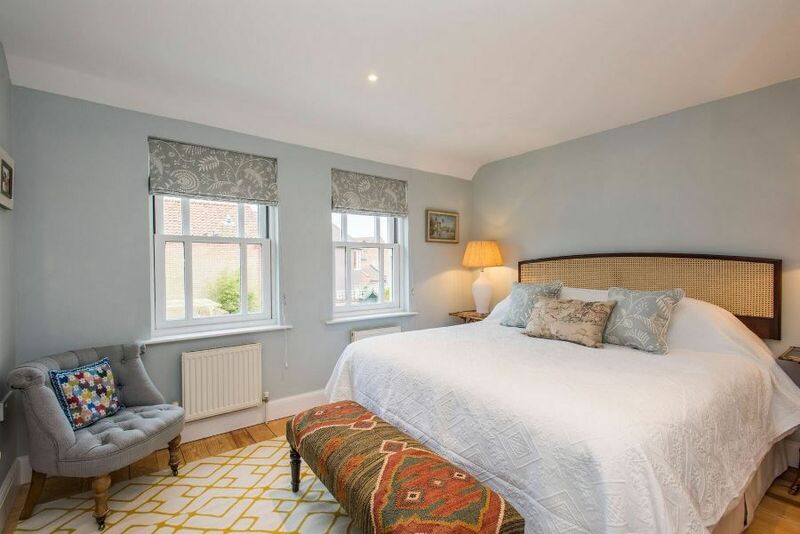 Bedroom 2: another beautifully presented room with grey painted twin beds, bedside tables and lamps, dressing table and mirror, built-in wardrobe, storage seat and a full length mirror. Bedroom 3: another lovely room which has twin wicker beds, bedside tables and lamps, built-in wardrobe and a chest of drawers. 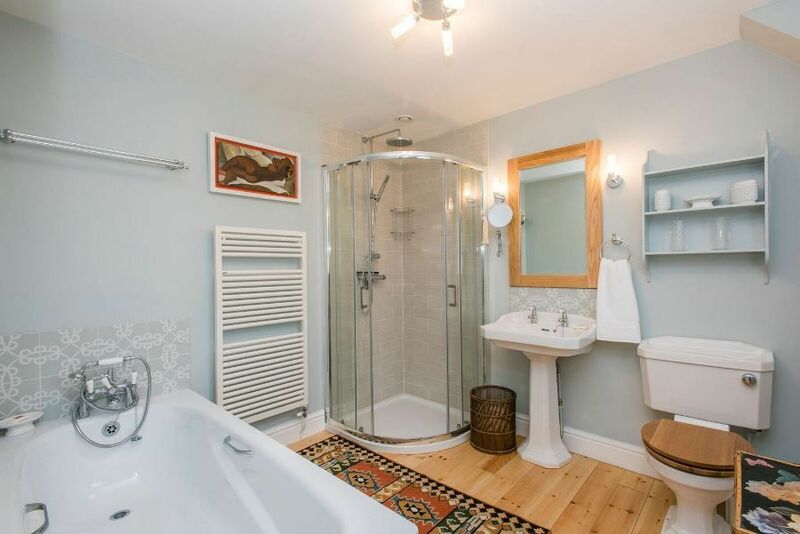 Bathroom: refurbished large bathroom with walk-in shower, vanity basin, bathroom cabinet, heated towel rail, WC. 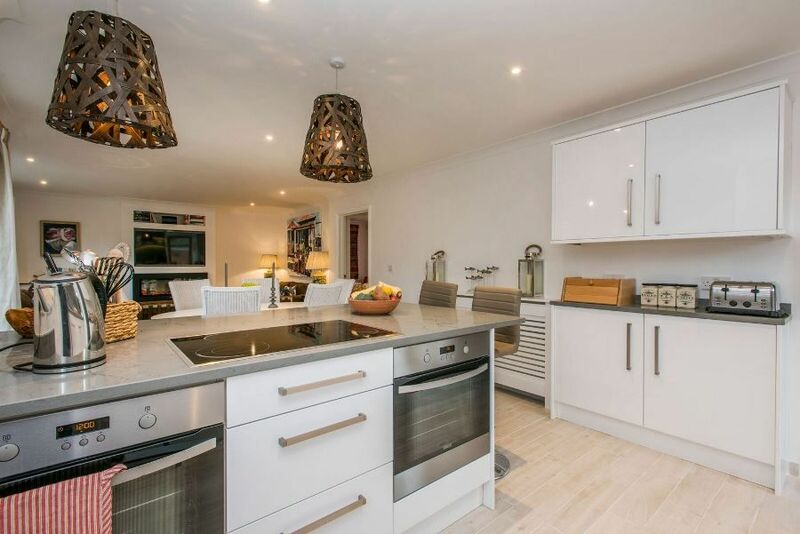 Arthur's is one of three properties quietly located down a private shingle drive off Ulph Place. 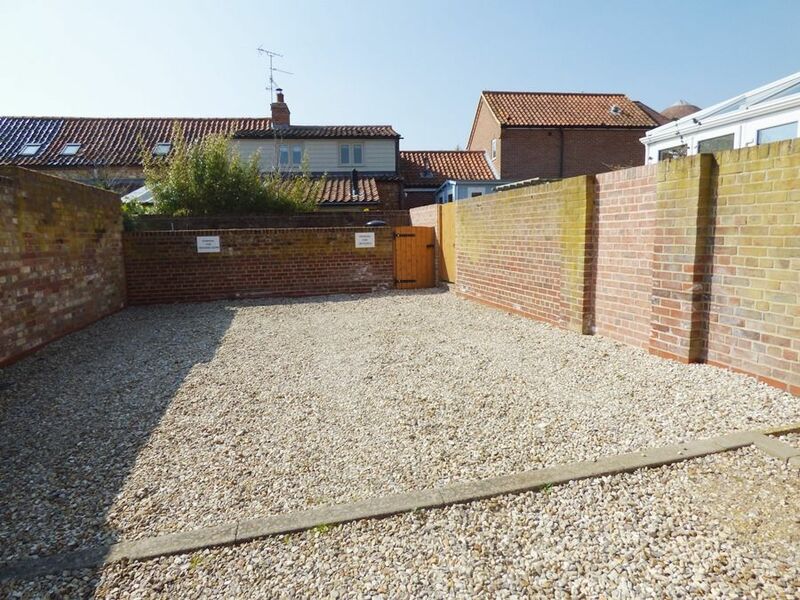 There is the advantage of two private off-street parking spaces; one to the side of the house and one directly in front (additional parking can be found at the car park on North Street). 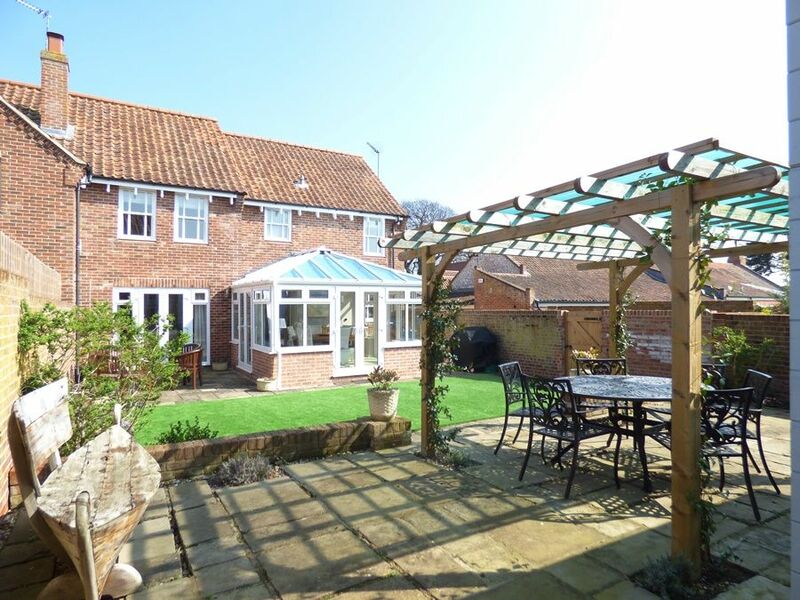 At the back is a generously sized garden, larger than average in Burnham Market, which enjoys a great degree of privacy. It is west-facing and completely surrounded by high walls, making it safe and secure for children and dogs. 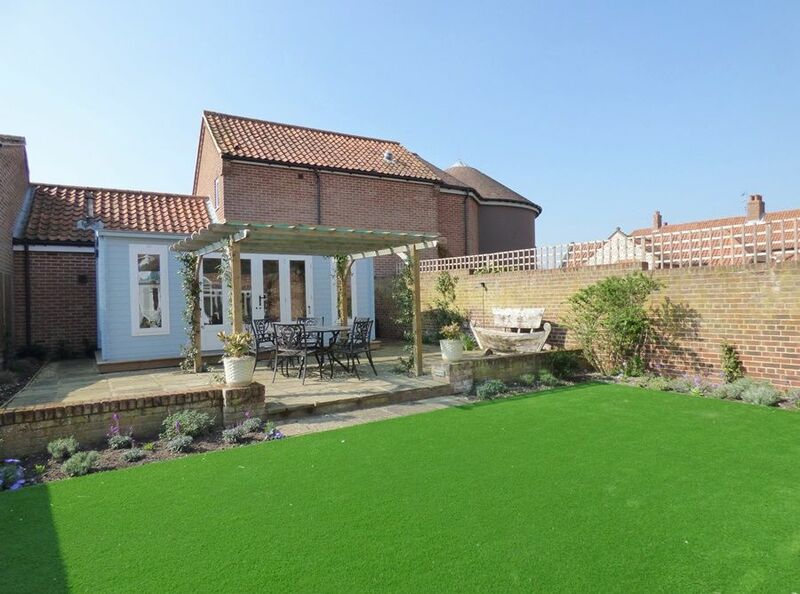 It has an artificial lawn and a terrace which catches the sun throughout the day. For dining al fresco, there is a charming pergola with outdoor dining table, umbrella with six comfortable chairs and a gas barbecue (which guests are requested to clean before they depart). There is also a lovely wooden summer-house in the garden comfortably furnished with sofas, leather armchairs, large rug, tables and lamps. This provides the perfect spot for sitting outside on chilly evenings or for children to play. 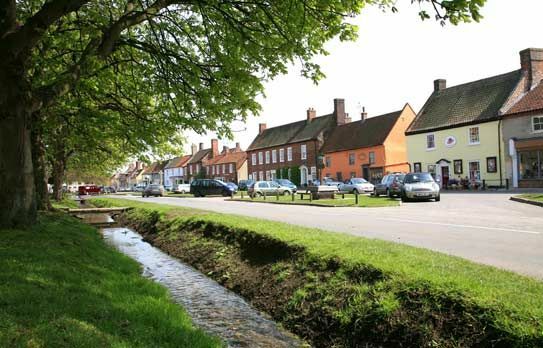 It is conveniently located only a minutes walk from Burnham Market Stores, selling a wide range of amenities, and close to the picturesque village green with a wide range of independent shops, galleries and boutiques. Please note short breaks are not available at this property. Better than Expected The house was lovely and warm when we arrived and was the same through our stay. Everything was well appointed and comfortable, it was like home from home We really liked the cosiness and warmth. Also the allowance for 2 dogs was key for us. They had a great time! Very well appointed, all bedrooms a good size and the living accommodation was ideal for 6. Garden and parking a real bonus! 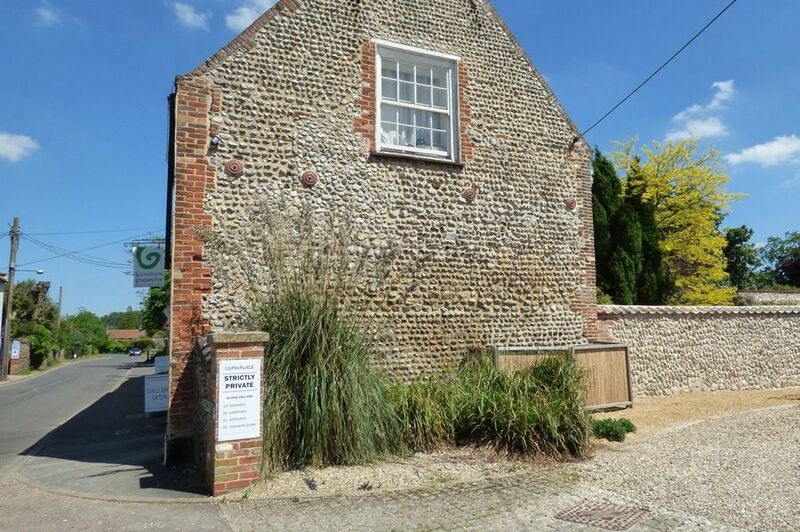 Good location, easy walk to the village centre and parking for 2 cars! The conservatory and summer house are a great addition. There was plenty of space for everyone and two televisions solved any viewing conflicts. An excellent place which ticks all the right boxes. I just wanted to drop you a quick e-mail to say what a lovely holiday we have just had. Arthurs was fantastic accommodation!! We spend at least two weeks a year in Norfolk and this is one of the best cottages we have stayaed in. Please compliment the cleaner as well, as the place was immaculate!! I see from the details that they are adding a conservatory/dining area for 2018, which I am sure will be amazing too.